Iran is a fascinating country for adventurous traveler, with great hospitality, helpful people which will make you feel welcome. Visit also Damavand Climbing and Tourism Tips. The currency is Rial, but people prefer to deal in Tomans. To understand the Iranian money banknotes, just ignore four zeros or 4 digits on the right hand side of the figures. Be aware of Persian holidays and long weekends specially in new year. These long holidays makes some problems for incoming foreign tourists, a great number of shops and tourism sites such as museums are closed and in addition there are big traffic jams on the main roads. Iranian weekend are Thursday and Friday. Friday = the weekend. The safety of your group and the quality of your tour are the main priorities, when you plan a climbing tour to Damavand, some tour organizers may offer you low costs and price, be aware that the quality of these services are very low too. Iranian speak in Farsi (Persian), however you may continue speaking in English, it's recommended to learn some Farsi phrases too, someone Persian speak enough English to translate for you, or show your right direction. In major cities such as Esfahan/Isfahan and Shiraz most street signs are in English too. Just ask local people and find a good restaurant for good and fresh food, no need to be worry about eating local food. Most Persian foods are tasty and healthy. On the road you can find good restaurants easily, look for where the truck driver stop! Fresh bottled water is available almost everywhere and very cheap. It is a little hard to find coffee in most restaurants, but there are variety of Nescafe 3-in-1. Leading Mt Damavand tour organizer. Ski touring and snowboard adventure tour 2015. Ecosystem, fauna and flora and natural attractions tours. 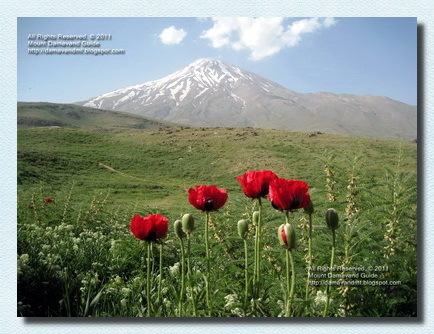 Damavand Tourism Tips - Damavand Tour. Damavand Tourism Tips and Climbing Tricks. damavand tourism tips, iran travel tip, damawand climbing tricks, iran tourism tips and tricks, tips for visiting iran, damavand sightseeing tour tips, damawand tourism information, damavand travel news, visit damawand iran, damavand climbing tour info. Damavand Iran hiking & trekking and ski expedition tours 2015. Iran outdoor tourism activities 2015, sightseeing tours. Iran alpine style mountaineerin tour organizer. Holiday tours cultural and historical tourist industry. Tour operator for special interest tours. Ascend to Damawand peak with the experienced mountain guides. Adventure tour organizer, guided tour winter climb, ski mountaineering and snowboard Alborz mountains. Welcome to join us for the best ski and Iran climbing tours. Damavand ski and snowboard expedition tour 2015, Alborz Mountain Range. Thermal spring tour, leading outdoor activities tour organization. Experience moutain tours with the best services. Hiking trekking outdoor sport for Iran holiday and vacation. Mountain ski tour. Comprehensive information for your Iran adventure travel tour. Climbing tour organizer in fully tailor made categories. Persian cultural and and historicl tour. Persian cultural and historical tourism. Guided mountain tours and ascends. Tour organizer and tour operator for Mt Damavand Iran. Useful links Damavand Iran, Damavand Trek, Damavand Hike. Bienvenue à nous rejoindre pour le meilleur de ski et des excursions d'escalade en Iran. Damavand ski et snowboard expédition tournée 2015, Mountain Range Alborz. Tournée de printemps thermique, principale organisation tournée en extérieur activités. L'expérience des visites montagne avec les meilleurs services. Randonnée trekking sport en plein air pour les vacances l'Iran et les vacances. Excursion de ski de montagne. Des informations complètes pour votre visite en Iran de voyages d'aventure. Escalade organisateur de tournée en collant parfaitement catégories faite. Persique culturels et et visite historicl. Le tourisme culturel et historique Persique. Randonnées guidées en montagne et monte. Organisateur de voyages et tour opérateur pour le mont Damavand Iran. Willkommen bei uns für den besten Ski-und Klettertouren Iran anzuschließen. Damavand Ski-und Snowboard-Expedition Tour 2015, Alborz Mountain Range. Therme Tour führenden Outdoor-Aktivitäten Tour-Organisation. Erleben Sie Bergtouren mit dem besten Service. Wandern Trekking Outdoor-Sport für den Iran Ferien und Urlaub. Mountain Ski Tour. 1- It is not possible to transfer money to Iran directly, when transferring indirectly, ie the deposit to your Iranian business partner, do not mention the name of Iran, you may just mention another term such as Mt Damavand Tour. 2- You can not use ATM system and your credit card in Iran. 3- It is not possible to use your credit card to buy goods. Only a few carpet shops will take credit cards and they'll charge you more. 4- Bring enough money in cash with you. 5- Upon arrival at International Airports such as IKA, you can change money, the rate is fare, there is not a major difference between exchange rates in bank and free market money exchange shops. 6- You can change $ US dollar or € Euros easily in Iran, money exchange shops are available in most cities. In most Iranian cities, you can find internet cafes, but there are some restrictions to some particular websites, the cafe employees may help you to get around it. For women, a light-weight scarf and manteau or a long top and pants are fine. Ok for open shoes, sandals acceptable, showing some fringe and make-up. For men, t shirts with short sleeves are fine, wear long pants, no shorts. There is no need to bring shorts - you shouldn't wear them in this country. Bring a light, breezy pair of pants.. It is easy to find digital cameras, memory SD cards, and batteries, you may find them almost everywhere, with low prices. If you get sick, pharmacies are almost everywhere and prices are very cheap. Benvenuti ad unirsi a noi per il miglior tour di sci e alpinismo Iran. Damavand sci e snowboard spedizione tournée 2015, Alborz Mountain Range. Primavera giro termica, all'aperto giro attività dell'organizzazione. Esperienza di escursioni moutain con i migliori servizi. Escursioni trekking sport all'aria aperta per vacanze Iran e vacanze. Montagna sci tour. Informazioni complete per il vostro tour viaggi d'avventura Iran. Arrampicata organizzatore tour in categorie rese pienamente sarto. Persiana e tour culturali e historicl. Persiana turismo culturale e storico. Visite guidate in montagna e sale. Tour organizzatore e tour operator per Monte Damavand Iran. Velkommen til bli med oss ​​for de beste ski og Iran klatreturer. Damavand ski og snowboard ekspedisjon tour 2015, Alborz Mountain Range. Termalkilde tur, ledende utendørsaktiviteter tour organisasjon. Erfaring fjellovergang turer med de beste tjenestene. Vandring trekking utendørs sport for Iran ferie og ferie. Mountain skitur. Omfattende informasjon for Iran eventyr reise tur. Klatring tur arrangør i fullt skreddersydd kategorier. Persisk kultur og og historicl turné. Persisk kulturelle og historiske turisme. Guidede fjellturer og stiger opp. Tour arrangør og turoperatør for Mt Damavand Iran. Добро пожаловать к нам на лучших горнолыжных и Иран восхождений. Дамаванд лыж и сноубордов экспедиции тура 2015 года, Эльбурс хребта. Тепловая тур весной, ведущих открытый гастрольной деятельности организации. Опыт moutain туры с лучшими услугами. Пешие походы открытых площадках для Ирана праздника и отдыха. Горнолыжный тур. Исчерпывающая информация для вашего Иран тур путешествия приключения. Восхождение организатор тура в полностью индивидуальные категорий. Персидской культурной и и historicl тура. Персидского культурного и исторического туризма. Прогулки горные туры и поднимается. Организатор тура и туроператора на горе Damavand Иран. Bienvenido a unirse a nosotros para el mejor esquí y excursiones de escalada Irán. Damavand de esquí y snowboard expedición gira de 2015, Range Montaña Alborz. Recorrido termal, principal organización exterior gira actividades. La experiencia tours moutain con los mejores servicios. Senderismo trekking deporte al aire libre para unas vacaciones de Irán y de vacaciones.